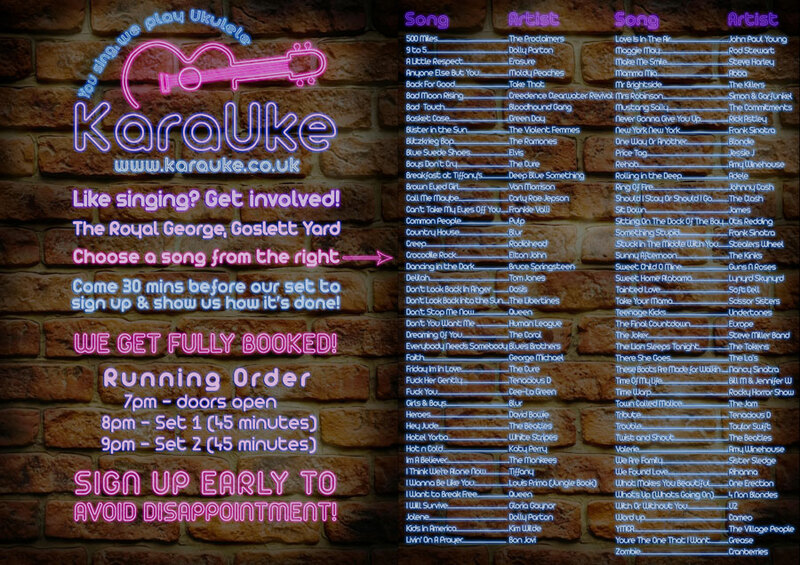 Join us for KaraUke – Karaoke with a Ukulele Backing Band! Yes it is that time of the month again. There is a double dose of KaraUke this month for those with excellent stamina and a craving to sing. After 5 pints it could be considered Zombieoke! What the hell is KaraUke? OK – how much? As always it’s free, but please join our Facebook event page! Click ‘attending’ here & invite/share to your friends! Also – if you enjoy it buy band members drinks! What can I sing? – I do a mean Brown Eyed Girl! Top songs include: Mr. Brightside, 9 To 5, Common People, F*** Her Gently, Forget You, These Boots Are Made For Walking, Valerie, Brown Eyed Girl, Can’t Take My Eyes Off You. New songs: Rolling in the Deep and a few others! Where is the venue, I get lost easily? For the second ‘secret‘ gig you will have to keep your ears to the ground or know how to navigate social media or this very website!